A pipe is a very simple tool used to hold burning tobacco. The smoke released from the burning tobacco is then drawn through a small tube and into the pipe smokers mouth. As simple as a pipe seams there is an incredible amount of skill that goes into making a finely crafted pipe. The Indians of North and South America over the course of a thousand years were only able to craft crude pipes made out of stone or clay. However, the European craftsmen were able to perfect the art of pipes in only a couple of centuries. Below you will find a diagram of a pipe and the 5 different parts that make up a pipe. Shank – Generally part of the bowl is used to neck the pipe down. Once a pipe is assembled, filled, and lit the smoke travels from the bottom of the bowl, through the shank, around the filter, through the stem, and into the mouth. The lip provides the mechanism to keep the stem from slipping from the mouth. The total design of the modern day pipe comes from years of trial and error and experimentation. The Briar pipe is always the first choice of any pipe smoker. Briar comes from a tough little tree called Erica Arborea, which is a member of the heather family. It grows no more than 20 feet high, and would never be thought of as a premier pipe material. The burl, which pipes are made from, is found just under the ground. It’s not tree trunk nor roots, it’s actually the meeting place for the two. Today nearly 30,000,000 tobacco pipes are manufactured across the world and the Briar Pipe is in reach of nearly every pipe smokers’ wallet. Ebay is an excellent place to find a great deal on a briar pipe, so check out their huge selection. Meerschaum is a mineral that comes primarily from Turkey. This material is soft and easily shaped but wasn’t used as a pipe material until the discovery of tobacco. Its scientific chemical name is hydrous magnesium silicate and is thought to be remnants of prehistoric sea shells. Once the pipes are carved they must be dried and polished. Meerschaum’s are renowned for the cool, mellow smoke, and remain very popular today. Meerschaum pipes have quite a long break-in period, but the smoker is rewarded with a beautiful autumn brown pipe and a full ripe quality and flavor. Corn Cob Pipe – Did you know that a small town in Missouri pumps out 15,000,000 corn cob pipes a year? The corn cob pipe industry has been supporting farmers since 1969. Farmers can sell the corn kernels then hand over the cobs to the pipe makers. The corn cob pipe is a great starter pipe since they are readily available and extremely cheap. 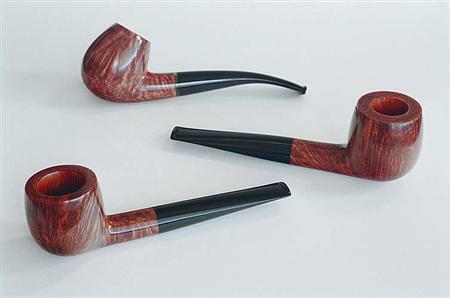 Most pipe smokers prefer corn cob pipes only to the coveted Briar Pipe. Great job on the guide so far! I’m looking forward to the next editions. You’re certainly right about the corn-cob pipes. They may look a little tacky, but their heat-dissipating properties will beat a low/mid-priced wooden pipe any day. Thank you for the great feedback. I was starting to think no one was reading my pipe smoking guide. Anyways I hope to have the next section out these week sometime. Great job on the pipe smoking guide. Can’t wait to read more. I am recently returning to pipe smoking. I had pipes in my 20’s but then gave up smoking because a certain someone I was involved with could not take the smoke. That person is gone and I am back to a pleasurable hobby long missed. I have been accumulating estate pipes over the last few weeks and hope to start learning how to restore them to their former glory. Any section of information you might post in that regard would be most welcome. Thanks again for a great site, keep up the good work! So far so good on the guide. I have noticed one error, however. “Meerschaum pipes have quite a long break-in period, but the smoker is rewarded with a beautiful autumn brown pipe and a full ripe quality and flavor.” Meerschaum pipes require NO break in period at all. In Fact, One should completely avoid building a cake at all costs. A carbon cake inside the bowl of a meerschaum pipe prohibits the bowl and shank from being perfused with the natural oils and tars released from the burning tobacco. Thus, resulting in no coloring whatsoever. What does the filter do since it is metal and the smoke doesn’t actually pass through it? What is the disadvantage of buying a filterless corn cob pipe to start out with? You have labeled “bit” in the diagram, but I was not able to find a definition for it. Is it an integral part of the stem, or is it something else. Warm regards. Bit is a part of “stem” itself and is designed to prevent the canine teeth from punching holes in the stem as done in a standard “bit”. I was at an antique mall and found a small clay pipe made by native americans. It is made from fired creek clay and required me to made a reed stem for it. It gets hot but the stem cools it back off. It isn’t an artistic thing but if still works after centuries. I bought it for $100. Not sure what it originally was decorated like but it makes me ponder who made it, owned it, etc. My research shows that a good pipe made by native americans would be passed down. There are numerous types though, even within the same tribe. While this is an informative article, it is ridiculous and Eurocentric to call the pipes of the New World cultures “crude”. Native Americans and First Nations people have been stigmatized as savages for far too long. I invite anyone to take a look at this: http://en.wikipedia.org/wiki/Image:MacoocheeMoundEffigyPipe.png And call it ANYTHING but art. I know this is a really old comment, but that was the first thing I thought! I couldn’t believe in 2012 comments like that were being made. I learned about Ethnocentrism 20 years ago in grade school. This is nonsense. Other than that the info is great. Do ALL tobacco pipes need filters, because i own a K&P Republic era pipe and it has no filter. 😉 Irish pipe smoker here,great site,just stumbled upon it,and want to add my own comment,have been smoking pipes since way back,briars and meerschaums and my favourite is a Dublin one by Kapp and Petersons,cost about 70 euros,but I have to say that after eating the corn cob for lunch I made a fine corn cob pipe and used the piece of bamboo in the garden as the stem with no filter,all worked great and cost zero.Tobacco Condor plug great aroma,my favourite. I have two meerschaum pipes. Both have a male and female insert that connects the shank and the stem together. I need the inserts. I live in Dallas Tx. and can’t find anyone that can help me. Try( Bear Briar.com) I just had my well over 100 year old Meerschaum fit with a new stem and was very happy with this mans work. He’s located in Calif.I e-mailed him he gave me a price,I sent the pipe to him ,and he returned it within a week(with the bill). No $$$$ up front,couldn’t believe it!!!!! I did e-mail a picture of the pipe so he was able to see it before I shipped!!! Hope this helps!!!! Stu. You’re observation is true. In comparison to the sophisticated pipe your diagram shows the Indian pipes were crude. That doesn’t mean you don’t like Indians it is just the way it is. Like the fact North American Indians dragging loads on sticks was crude compared to a wagon with wheels. Is is what it is. Not a commentary on the intrinsic value of first peoples. Great article, thanks for the beginner info. I’m a cigar smoker but curious about pipes and may be interested in possibly changing teams. 🙂 I find a cigar takes too long to finish so I often wind up wasting half the cigar so I’m looking into pipes. It has been a long time since I smoked a pipe. I am thinking on going back to a pipe. I am pretty new to this pipe thing. I was looking at tobaccopipestore.com to buy a basic pipe. And recommendations? I’m not going to look at the bits of truth and falsehood here, I’m just going to say that this is a really tacky, impolite, downright mean thing to say, which makes *you* guys look bad. It’s also simply offensive. You should look into the vast variety of different (and not “crude”, nor only stone and clay) pipes made by Indians. Grow the f… up, boys!! Whoa, now I see that you’ve had this sort of comment *years* ago, and yet you leave this nasty language up. I had thought you were decent guys who just needed a friendly nudge, but it seems that you’re actually determined to keep displaying your ugliness. Hi Nathan, Great information you have here. I have a question perhaps you can answer. In my picture is a pipe I inherited from my Great-Grandfather. Notice the little feet under the bowl? Have you seen this style before? Does this little feature have a name? Is it common? sorry, no pic. I guess my gravatar isn’t working. i love to smoke pipes. i have a corn cob and a chinese sanda. the corn cob is awesome lots of flavor from the tobacco but regular cleaning needed. the sanda is ok but the flavor is weak and the parts dont fit tight but come apart in 5 peices for easy cleaning. if u want to smoke a pipe its best to look and research hard for a pipe that fits you. i hear the most important thing is how it looks to you . if the looks dont appeal to you its best not to get it. if corn cob appeals to you you cant go wrong. I love all my pipes have a quite nice collection indeed. Thank-you for writing these. I purchased a box lot of old pipes will be listing them on ebay starting May 13th (after vacation). Now I can do a better job naming the parts. Check out moms-hobby auctions. I’d appreciate any education you can share. My favorite part of my ‘treasure hunting’ hobby is LEARNING! There is no ‘break-in’ period with a meerschaum. 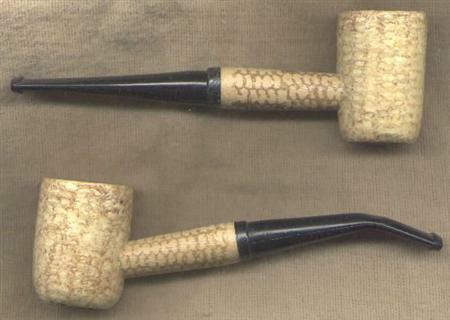 The coloring of the pipe over time is not ‘break-in,’ and the formation of cake on the inside of the bowl–which _is_ break-in, for a briar pipe–is something you absolutely DO NOT WANT in a meerschaum, as it acan cause the bowl to crack due to differing rates of expansion between the cake and the meerschaum itself when heated. You ought to correct this.